It’s safe to say that St. Simons Island is a haven for Georgia Bulldog fans at the annual Florida face-off that’s held in nearby Jacksonville each year. Though you may find this particular weekend a bit of a distraction for your Georgia destination wedding, here’s a great takeaway: a groom’s cake themed in honor of THE team, whatever that may be for you. 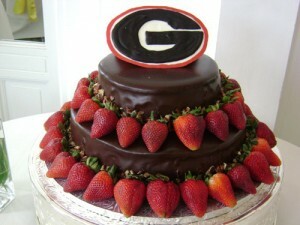 Kudos to The Baker’s Man in Atlanta for this enthusiastic yet classy number. Not a Dawgs fan? Envision Clemson tiger paws, a Crimson Tide helmet, an Atlanta Falcon on the wing…….. So when you’re cheering for your favorite team this weekend, think of this sweet twist, then plan your St. Simons Island wedding at the King and Prince! This entry was posted on Friday, October 26th, 2012 at 9:57 am	and is filed under Weddings. You can follow any responses to this entry through the RSS 2.0 feed. Responses are currently closed, but you can trackback from your own site.